San Francisco video/chat startup Seesmic has acquired Twhirl, a popular application created by German developer Marco Kaiser that allows users to access the Twitter service directly from their desktop, and also cross post to other services like Pownce and Jaiku. The acquisition price is not being disclosed. 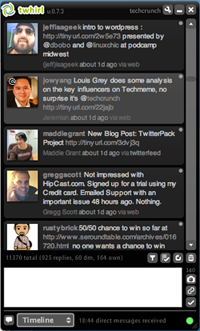 Twhirl is considered among the better third party Twitter applications. ReadWriteWeb, for example, just yesterday identified it as the third most used method for posting to the Twittersphere, behind the web and instant messaging, and just in front of Twitterific. It has been downloaded 100,000 or so times. Seesmic says they will continue development of the application and eventually integrate their own service into Twhirl, making it the official Seemsic desktop client. It’s important to note that Michael Arrington is a minor investor in Seesmic and so we won’t add a lot of commentary on the transaction. Look for a company announcement soon.